How much does an asphalt driveway cost? What is asphalt and how does it differ from concrete? Asphalt is similar to concrete in the sense that both materials are popular for creating solid-surface driveways, plus they’re both made with stones (bits of rock) and sand. However, the binder that locks these materials together is very different – while concrete uses Portland cement, asphalt uses asphalt cement. Why should I choose asphalt (over concrete, for example)? Asphalt has a softer (less ‘edgy’) look than concrete, and offers high performance at about half the cost. It’s also easier to install – provided you have the right equipment and a capable crew of tradesmen to do the job. Another plus is that you can drive on it immediately, whereas there’s a waiting period for driving and parking heavy vehicles on concrete. Because asphalt is a petroleum product, it is flexible, which makes it less prone to cracking and easier to contour than other paving materials. And if it is simply worn (read: not heavily cracked) you can easily repair it by filling in and sealing the damaged areas, or by resurfacing the driveway. Oil leaks are also not as noticeable on asphalt as they are on concrete, and it performs better in severe winter conditions. That’s because concrete is more likely to crack when exposed to the freezing/thawing process. What would the red flags be when considering asphalt? In areas where winters are mild, asphalt driveways don’t last as long as concrete (20 years as opposed to around 30 for concrete), plus they require more maintenance as you need to seal coat them regularly. Lastly, asphalt is not as versatile in terms of aesthetic appeal as concrete, as the design option are limited. Having said that, while asphalt is currently only available in black, there is an emerging trend towards granite and blue stone edging, which (albeit being a bit more pricy than standard asphalt), adds a funky edge. In New Zealand, an average asphalt driveway that spans around 80 to100 square metres will cost you an estimated $80 to $100 per square metre (less GST). This includes the excavation and preparation costs. Bear in mind that these prices can vary depending on the price of crude oil – with asphalt being a petroleum product, it makes sense that it generally costs less when the oil prices are down. Another cheaper paving option to consider is recycled asphalt – it costs less than standard asphalt and is a popular option for lengthy driveways, such as those on farms and in other rural areas. The installation typically involves installing a 12 to to 24cms graded and compacted gravel base over solid ground. This is then topped with 6 to 12cms of asphalt. If you decide on an asphalt driveway, it’s crucial to make sure that it is reinforced properly. Because the asphalt can move around in hot temperatures, the crushed gravel beneath the driveway must be deep (at least 24cms) and compacted properly – your contractor should use a roller that weighs at least one tonne in order to achieve this. Also make sure the soil under the gravel is super strong, compacted and well drained. How long does asphalt last and how do I maintain my driveway? 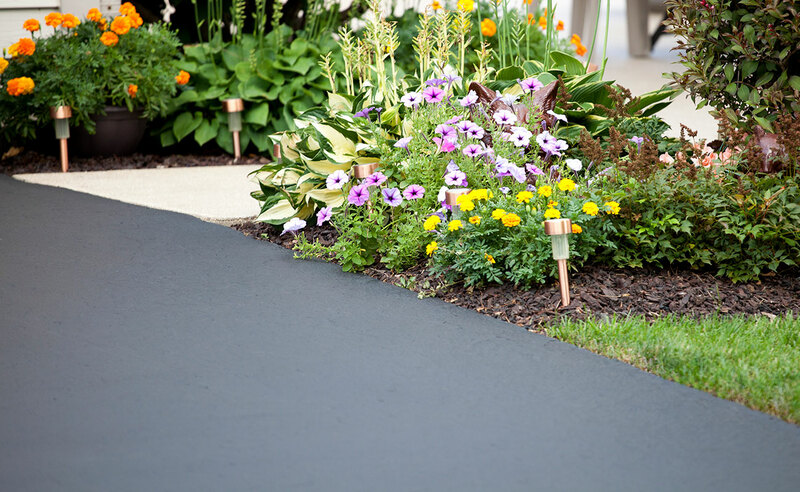 Asphalt driveways typically last 12 to 35 years, depending on the quality of the installation, climate, how often you use the surface and how well it’s being looked after. To maintain your driveway, clean it at least every six months, using a stiff broom and spray hose to remove any stubborn dirt. To help prevent water from seeping into potential cracks in the asphalt surface, you also need to seal coat the asphalt every two to five years (or up to eight if it has been constructed and maintained well). Allow any new driveway to cure for at least one a year before sealing it. In fact, you don’t need to seal it until the asphalt turns grey or the cement has worn off the rocks inside it. A rejuvenation coating can also be used instead of sealant. What do I do to restore a worn asphalt driveway? Resurfacing – applying a layer of new asphalt in existing asphalt – is a great way of giving old asphalt a new lease of life. Having said that, prevention is always better than cure and when prepared, constructed and looked after well, your driveway shouldn’t need resurfacing until at least 15 years after it’s been installed. When resurfacing, bear in mind that cracks and holes in your existing driveway can become visible through the new surface, so it pays to repair those first (better still: repair them as soon as they appear, as part of your maintenance process). Applying a layer of asphalt on top of an existing layer can also create water retention issues – make sure you have excellent drainage, otherwise you might end up with a driveway full of puddles! Make sure to explore all the different materials you can choose from to create a driveway. Find out How much does a concrete driveway cost?